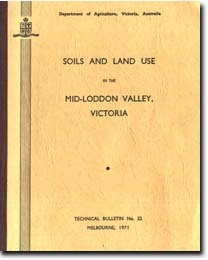 This report on the Soils and Land Use in the Mid-Loddon Valley, Victoria was prepared by J.K.M Skene of the former Department of Agriculture in 1971. This report concerns the detailed soil survey of about 620,500 acres of farm land and forest reserve in the Counties of Bendigo, Gladstone, Gunbower and Tatchera. 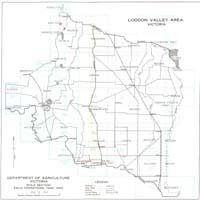 About 359,000 acres is in the constituted Irrigation Areas of Boort, Calivil, Dingee and Tragowel Plains, and of this area approximately 171,700 acres is irrigated. Rather more than half of the irrigated land is under annual pastures, while about one-sixth is under perennial pastures. Other crops irrigated are lucerne, summer fodder crops and cereals. 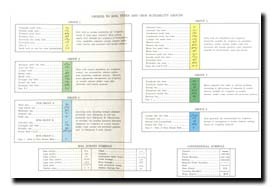 A considerable area of fallow is irrigated prior to sowing cereals. The agricultural pursuits on the irrigated land are fat lamb raising, sheep for wool production and dairying.